Can you hear the buzz? The clamor? The excitement??? If you were anywhere near my Facebook profile yesterday you probably already know about the big Beachbody news – but if not, I’ll stop with all the suspense and just fill you in on what was just announced! Should I make you wait a bit longer?? Haha sorry – I’ll tell you now – Strawberry Shakeology is being released!!! I haven’t had a chance to try it yet, but I have heard rave reviews from the coaches who have been able to and I seriously cannot wait to get my hands on it! It is combining the incredible nutrition of Shakeology with a great strawberry flavor. They already have a vegan tropical berry, but for those of us who don’t require a vegan meal plan this will be a great change! 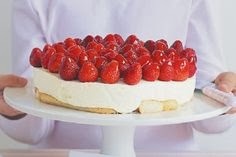 There have already been recipes shared – Strawberry Cheesecake? Strawberry Shortcake? Sign me up, please!! Yummy taste without the calories!!! Drinking Chocolate Shakeology has helped my cut my chocolate and sweets cravings by an incredible amount, but there are still some days when I want something sweet, just not necessarily chocolate – I’m pretty sure Strawberry Shakeology will be right up my alley! I cannot wait to get my first shipment of Strawberry – I’ll be sure to share the recipes that I use! What do you think about it? Are you interested in trying out Strawberry, or does the chocolate or vanilla seem more up your alley? At the end of the month I’ll be running a clean eating & Shakeology 30-day group – it hasn’t been officially announced yet, but if you’re interested let me know! I’d love to get you all set up to learn more about clean eating, nutrition, Shakeology and how those three together can seriously transform your health from the inside out!